Heliopsis helianthoides. Common names include Ox-eye, Early Sunflower, False Sunflower. 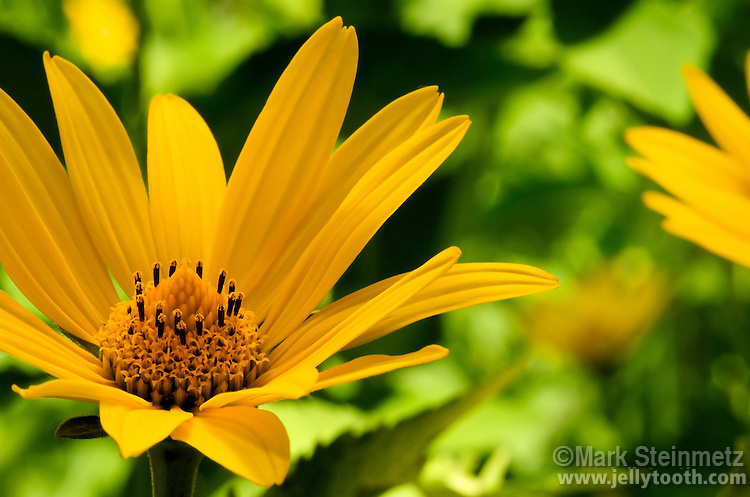 The latter name comes from the close appearance to the true sunflowers (Helianthus spp. ), however, only the disks flowers from sunflowers are fertile and produce seeds, while both the disc and the ray flowers Oxeye plants are fertile and produce seeds (achenes). This native perennial plant can be found throughout primarily eastern north america in a variety of habitats, but is a signature prairie species of the Midwest. Plant is 2-6 ft. tall. Long blooming - early summer to late fall.